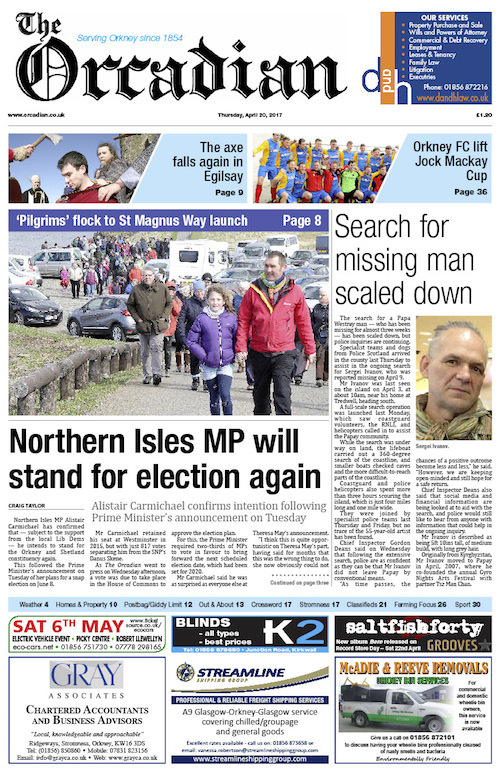 This week’s edition of The Orcadian is now available from all the usual outlets, and here. • Northern Isles MP Alistair Carmichael has confirmed that — subject to support from the Liberal Democrat party — he intends to stand for the Orkney and Shetland constituency during the planned ‘snap election’ on June 8. • The search for a Papa Westray man — who has been missing for almost three weeks — has been scaled down, but police inquiries are continuing. • ‘Pilgrims’ flock to the launch of the St Magnus Way. • Further comments on new of Prime Minister Theresa May’s recently announced snap election. • One of the foremost experts on Neolithic Britain, professor Colin Richards, joins the University of the Highlands and Islands. • Acclaimed Orcadian folk duo Saltfishforty talk about their new album, Bere. • Those hoping to represent Kirkwall West & Orphir and the East Mainland, South Ronaldsay & Burray in the upcoming council elections have their say.